Dylan Thomas Birthplace carries Welsh hopes at top heritage awards. The Birthplace of Dylan Thomas in Uplands, Swansea is the only Welsh heritage attraction shortlisted for a prestigious Hudson’s Heritage Award with the outcome being announced at a presentation lunch on Tuesday 14th March in Goldsmith’s Hall in London. The house which has been restored to its condition as a new house when bought by the Thomas family in 1914 is not only up for an award for the Best Accommodation but also for the Best New Discovery Award. The independent Hudson’s Awards were started in 2011 by publisher Norman Hudson to celebrate the high quality experience enjoyed by visitors to a range of heritage attractions and this year there are ten categories. In the Best Accommodation category the Birthplace is up against Shropshire duo Western Park and Combermere Abbey as well as Bamburgh Castle in Northumberland while vying for the Best New Discovery with the Birthplace are Blenheim Palace, Eltham Palace and the RHS Lindley Library. A Visit from America…Taylor University students seek out the true Dylan Thomas. In his last few years, Dylan entertained hundreds of American students on his great but gruelling reading tours of America. He famously wrote a humorous piece on his experiences of the USA tours called A Visit to America. Due to his popularity and legacy, we at his Birthplace are too, becoming very used to hosting travelling American college and university groups. One such group was the one which consisted of students and faculty members from Taylor University, Indiana, USA whom we had the pleasure of hosting recently. The group from the English department, are currently on an off campus study tour which combines reading of major British authors (Jane Austen, Thomas Hardy, Robert Louis Stevenson, Virginia Woolf, and others) and extensive sightseeing. Most of the trip is spent in London, with the class also travelling to other locations of literary significance. In this case they have chosen to look at Dylan Thomas and his Ugly, lovely town of Swansea. The collection of culture vultures (as Dylan would term them) naturally acknowledged the importance of 5 Cwmdonkin Drive, the house of his birth and where a near two-thirds of the writer’s incredible works were painstakingly crafted from the snug confines of his tiny bedroom. We wish them well on their travels and urge them, do not go gentle when exploring the works of Wales’ most renowned writer but to dive in head first! 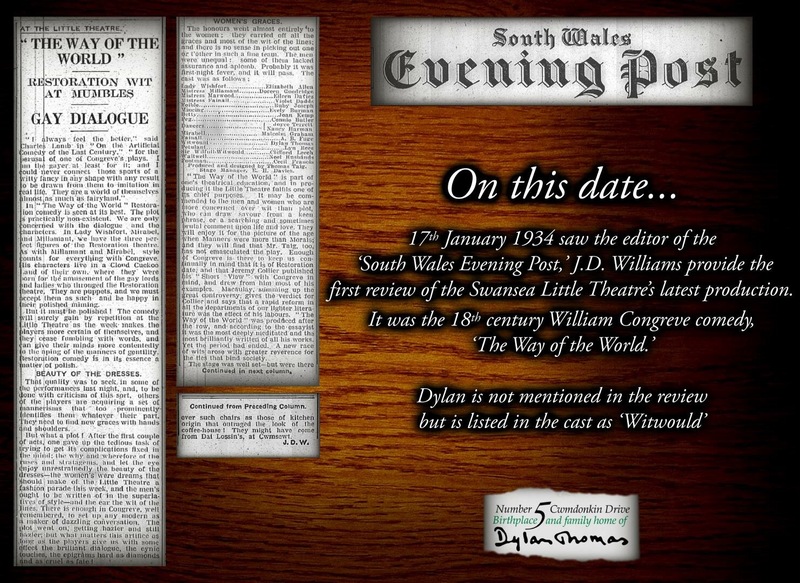 A highly complimentary review of Dylan’s first published book Eighteen Poems appeared in The Swansea Review section of the Swansea & West Wales Guardian newspaper. This seems to be the first instance where the book was reviewed in a Welsh periodical. ‘Mr. Thomas is doing with poetry much the same as James Joyce did with prose. He is making a new language, not a Joyce did by making numerous languages to produce an illegitimate literary off-spring, but hammering new meaning into old worlds and phrases; crowning backs with the alchemy of his essentially poetic imagination.